I just love being down at our market on Saturdays. We see almost a thousand people every Saturday. Of these, I think that at least one third are regular customers. This means that the Janesville Farmers Market is a regular destination for hundreds of people every Saturday morning. Why do so many individuals and families flock to our market? There are several reasons. Certainly the sweet treats, the entertainment, and the wide variety of local crafts help draw people in. Still, I think the real strength of the Janesville Farmers Market is the farmers. This year the Janesville Farmers Market has hosted vendors from thirty different local farms. Not every farmer comes to the market every week. 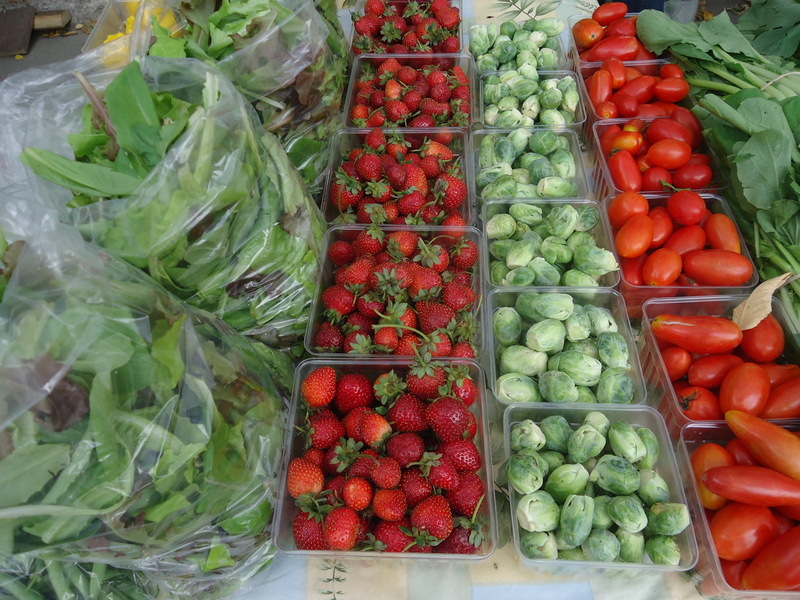 Some farm vendors specialize in certain crops that have a limited season, such as berries or asparagus. Some farmers offer both farm products and crafts. Most of our farmers, however, bring a variety of products that change throughout the growing season. All of our farmers grow the products they sell right here in Wisconsin. Farm sizes vary from three acres to three hundred acres. Growing styles and seed varieties also vary tremendously. Since the vendors actually participate in growing their own products, they can be a tremendous resource for learning and understanding more about the food we eat. When you shop at the farmer’s market, you can participate directly with your food in a way that grocery stores and non-local markets cannot offer. I take several opportunities to walk around the market throughout the day each Saturday morning. As I walk and look and listen, I often hear customers asking questions about the farm products. How was this corn raised? How can I best cook this meat? What do I do with eggplant? These are consumers who care about how and where their food is grown. The answers they get will help them make informed choices about what to purchase and eat. The questions they ask will help the farmers to understand what consumers want to purchase at the market. When they plan next year’s growing season, they will remember that customers were asking for a certain kind of vegetable or a specific growing method. The relationship goes beyond just supply and demand. The food we buy at the market has a face. The customers have a face and a voice. You can come down to the Janesville Farmers Market and shake the hand that feeds you!